Lovely Plugly Custom Plugs Blog: Glitter, Galaxy, Faux Dichro Plugs UK: NEW PRODUCT: Skinfills! They're Ace! One of our original plans was to make gorgeous plugs that wouldn't break your heart if you lost them in a mosh-pit or a festival. These tick all our boxes -- they're hard-wearing (they can survive me and I'm really good at breaking stuff), lightweight, asthetically pleasing and most importantly cost-effective. 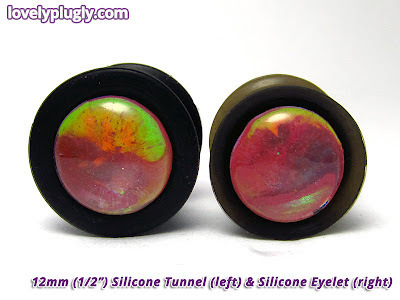 They fit into certain types of silicone eyelets and tunnels and their purpose is to sit right there, in your ears, looking all lovely. They pop in and out easily enough, yet they don't fall out and can withstand motorcycle helmets and extended periods of headbanging. They've survived defenestrations, walls, sleeping, alcohol, showers, etc without batting an eyelid. They're not too keen on hair-dye, mind. They will definitely fit into the silicone eyelets and tunnels we sell, and there is a possibility that they may fit other types as well. We're introducing these as a prototype as they're currently 'structurally inelegant' but they look wonderful when worn and are comfy so there's no problem there. They just need refining, which we can't really invest in until we find out whether there is any interest in them. 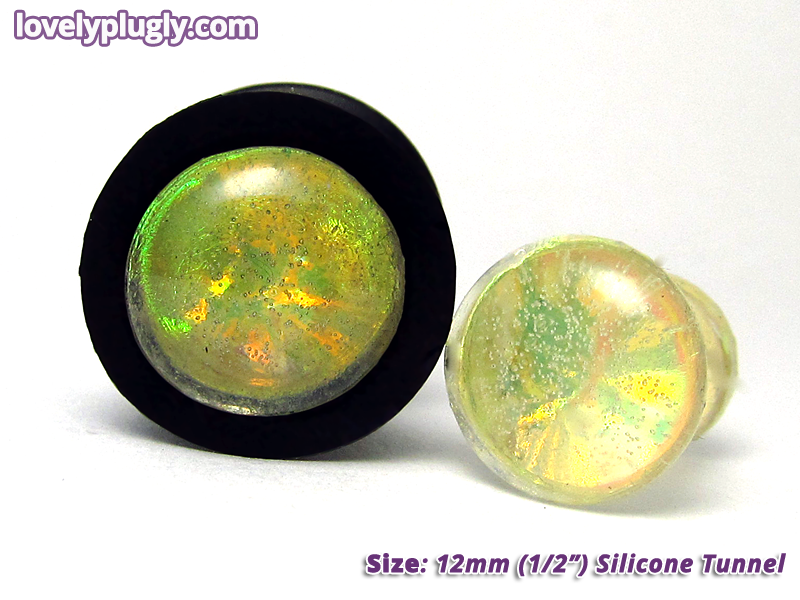 We'd also like to make them for a wider range of sizes and silicone tunnels, like the nice Kaos ones. Photos do not do these plugs justice in any way, shape or form so we've uploaded some videos of these in action -- have a look at them on our YouTube channel. There's also a video of our Pink Rainbow Fabulous Flashers down below. Skinfills are now available in the shop in sizes 8mm to 14mm from an introductory price of £3.50 each and you can find compatible silicone tunnels and eyelets here. We're open to making some in bigger sizes if you're interested. We're also taking custom orders for these as well from an introductory price of £4.00 each, please make a custom request if there's something you'd like.